New Delhi, February 1: “For years, many initiatives have been initiated for farmers but sadly, lot of farmers never came under the ambit of these schemes. 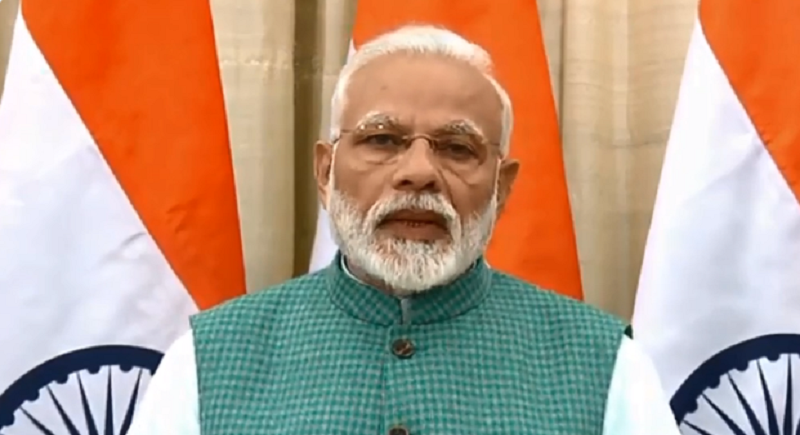 From middle class to labourers everyone has been taken care of in this Budget”, assured PM Narendra Modi while addressing the media after FM Piyush Goyal presented the Interim Budget for FY 2019-20 in the national capital today. Interim Budget brings cheer for the middle class. Individual taxpayers with annual taxable income of up to Rs 5 lakh will now get full tax rebate. TDS threshold for rent has also been increased from Rs 1.8 lakh to 2.4 lakh, Modi lauded the key decisions for the day. "It is with the governmnet's efforts that the poverty in ridden society is on the verge of elimination. I meanwhile congratulate the middle class and the salaried people for the tax benefits availed", he added. Stressing at the PM Kisan Samman Nidhi scheme, PM Narendra Modi said that for farmers, there have been several schemes by different governments from time to time, but only 2-3 crore farmers were included under these schemes. But now PM Kisan Samman Nidhi scheme will benefit over 12 crore farmers who own 5 acres or less than 5 acres of land. “This scheme is a historic step for farmer welfare”, he added. The acting FM meanwhile commented on the same saying, “Those sitting in AC rooms cannot understand the plight of the small farmers. Keeping this in mind, we have introduced Pradhan Mantri Kisan Samman Nidhi scheme. This is a historic decision”. Citing the financial estimate presentation in the Lok Sabh today, the opposition party have alleged the ruling government of copying the Congress' declaration regarding the poors to have the first right to the resources of the country. P Chidambaram, in the series of tweet further said that this particular budget was not a Vote on Account but was and ‘Account for Votes’. Also the Congress party president Rahul Gandhi, addressing the Prime Minister said that, 5 years of his incompetence and arrogance has destroyed the lives of our farmers. Giving them Rs. 17 a day is an insult to everything they stand and work for. Rubbing off the allegations, PM Modi asserted, “From middle class to labourers, from farmers growth to the development of businessmen, from manufacturing to MSME sector, from growth of the economy to development of New India, everyone has been taken care of in this interim budget. The unorganised sector needed more safeguarding of their interests and the Budget has done so. The PM Shram Yogi Man Dhan Yojana will strengthen the lives of the pensioners. Ayushman Bharat Yojana and social security schemes are also going to touch their lives positively”. Meanwhile the Lok Sabha speaker Sumitra Mahajan appreciated the budget saying that the wholesome is good one and that the work will go on alike scheduled.